The Pittsburgh Penguins finished second in the Eastern Conference and advanced to the Stanley Cup Final last season. With their sterling roster of talent a year older and a year more experienced, they might not finish second to anyone this season. How scary is Pittsburgh's talent base? Without Sidney Crosby – the reigning MVP and League scoring champion – for seven weeks due to an ankle injury, the Penguins went 11-6-4 and cruised to the top of the Atlantic Division. Crosby's absence allowed Evgeni Malkin to shine, and the second-year Russian forward finished second in the League scoring race and the Hart Trophy balloting. Other players stepped the fore, including goalie Marc-Andre Fleury, who returned from his own ankle woes to become the stopper the club hoped for when it made him the first pick of the 2003 Entry Draft. The hockey renaissance in Pittsburgh continued off the ice, as ground was broken on the team's new home in August. After years of unfulfilled potential, Fleury returned from a nearly three-month absence to reclaim his starting job from Ty Conklin and win 10 of his final 13 starts. His strong play continued in the playoffs as he posted a 1.97 goals-against average and .933 save percentage to help the Pens reach the Cup Final. He was a far more confident player when he came back from his ankle injury, and the hope is the strong play carries over to next season. Dany Sabourin returns as Fleury's backup. Sabourin lost the No. 2 job to Conklin last season, going 10-9-1 with a 2.75 GAA and .904 save percentage. At best, he'll be able to give Fleury the odd day off. With most of the attention focused on the club's offensive firepower, Pittsburgh's impressive defensive abilities were woefully overlooked. The Pens were No. 10 in the League in goals allowed (2.58 per game) last season, and were even better in the playoffs, finishing second to Detroit with 2.15 goals allowed per game. While the Pens aren't the most physical team in the League, they did retain a bit of toughness by re-signing Brooks Orpik. Orpik finished second in the League among defensemen with 239 hits, and his 125 blocked shots was third among the team's blueliners. Hal Gill and Rob Scuderi also bring a strong stay-at-home presence on the blue line, which allows Sergei Gonchar and Kris Letang to jump into the play offensively. Gonchar had a resurgent season in 2007-08, finishing second among the League's defensemen with 65 points, and his plus-13 rating marked his best defensive performance since the 2002-03 season. Letang had 17 points in 63 games as a 20-year-old, but wore down in the playoffs and was a healthy scratch for most of the Cup Final. With a season of experience, his offensive upside should be more evident in 2008-09. Ryan Whitney will start the season on the injured list after August foot surgery, which will open the door for either veteran Darryl Sydor or offensive defenseman Alex Goligoski, a 2004 second-round pick who had two points in three late-season games. Despite losing Marian Hossa and Ryan Malone in the offseason, the Penguins remain loaded up front. In Crosby and Malkin, Pittsburgh has two of the most dynamic scorers in the League. They have shown they can excel on separate lines, or play together to create an offensive juggernaut. Despite missing 29 games with a high ankle sprain, Crosby finished with 24 goals and 72 points in 53 games. He was No. 31 in League scoring, but third with 1.36 points per game. Finally healthy in the playoffs, he led all players with 21 assists, and his 27 points tied Detroit's Henrik Zetterberg for the League lead. Crosby not only is the team's best player, he's their hardest worker. With him buying into coach Michel Therrien's defensive system, the rest of the team has no choice but to follow along. Malkin followed his Calder Trophy performance of 2006-07 with 47 goals and 106 points last season, and he had 10 goals and 22 points in the postseason. His game continued to grow in his second season in North America. Still just 22 years old, there's little doubt Malkin can continue to ride shotgun with Crosby well into the next decade. 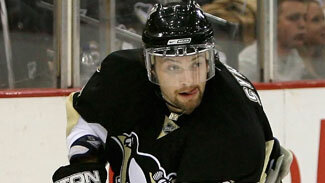 Petr Sykora also will return after his 28-goal, 63-point season. The 31-year-old forward has the added incentive of playing for a new contract; he will be an unrestricted free agent after the 2008-09 season. To fill the gaps left by Hossa and Malone, Penguins General Manager Ray Shero signed veterans Ruslan Fedotenko and Miroslav Satan away from the New York Islanders. Each had 16 goals for the low-scoring Islanders, but with the potential to flank Crosby or Malkin, those numbers seem sure to go up. With just 12 goals last season, Jordan Staal was a bit of a disappointment, but he had six goals in the playoffs. As he continues to grow into more of a power forward, he could pick up Malone's ice time in front of the net on the Pens' power play. With Georges Laraque, Jarkko Ruutu and Gary Roberts leaving over the summer, the Penguins will need Max Talbot and free- agent pickup Matt Cooke to supply missing grit. Talbot struggled with an ankle injury last season and had just 26 points and 53 penalty minutes in 63 games. Cooke had 23 points and 91 penalty minutes last season with Vancouver and Washington. * Everybody's healthy. Outside of the rash of ankle injuries that claimed Crosby and Fleury last season, the Penguins are remarkably well-conditioned. Malkin and Staal played all 82 games last season; Staal has missed one game in two seasons, Malkin just four. Sykora played 81 games last year, and Gonchar has missed 11 games in the last three seasons. * The success arrow seems to be pointing up. Since Crosby's arrival in 2005, the Penguins have gone from No. 29 in the League to No. 10 to No. 4 last season. Their core group gained tremendous experience in playing for the Stanley Cup last spring, and that experience will serve them well when things turn tough this season. * The team is set for the long-term. Crosby's five-year extension kicks in this season. Malkin, Fleury and Orpik all signed long-term contracts that carry them through the middle of the next decade. The Penguins are set up to be good not just in 2008-09, but for the long haul.